I've been looking around the cosplay/larp/derp section and I was somewhat unimpressed that there weren't any attempts of making Astartes power armour by any members of this forum. Shame on you, heretics! I'm making Chaos Space Marine armour - it's true! In fact I've gotten a little further than that, I've got two shoulders done, and working on the bolter. That's my bolter so far, incomplete obviously, but coming along nicely I think. Some of you may be wonder why paper? Well, the idea is to coat it in resin and fibreglass to make it solid, and then apply automotive body filler to the outside, smooth it off and start painting. I can tell you I'm no expert at this, I'm getting my lessons over at 405th.com, who do the same but with Halo and other costumes (including a few other Space Marine costumes). Just finished this helmet, this is the version without the horns (obviously), and I'll do the horned version later, but what can you suggest? Smaller grill? Different eyes? Pipes were purposefully left out so they can be added once the fibreglass/body filler was done, but should I add them anyway? Any feedback, criticism, encouragement, discouragement, anything would be helpful. Oh and if you want to make the armour yourself, just ask, and if the request is popular enough I might have to make another topic. Absolutely awesome! 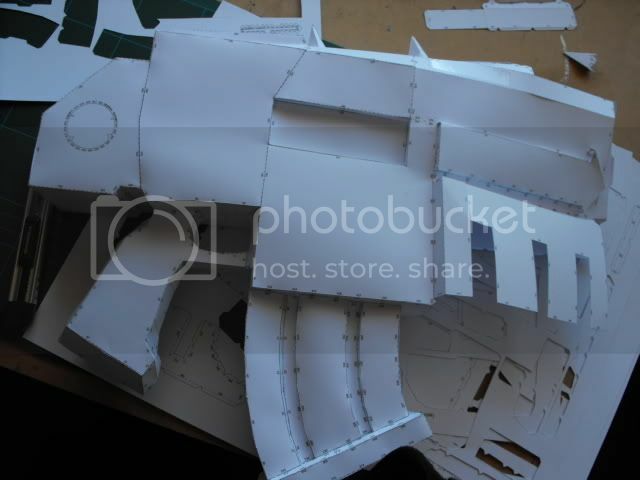 To think of the shape as paper thats still to be moulded cant wait to see more! Any plans for a warp blade or chainsword? I think I'll just have a bolter and a permanently sheathed blade on the outer thigh. Sorry that there's not much in this forum we only just got it set up. I'm very glad we did because now we get to see CSM power armour from start to finish. Oh and hey if this is the quality to show show off as much as you like! Looks good on the scale Vs practicality front. Which chaos Chapter or Legion are you thinking of doing? We can defiantly bombard you with the right symbols etc. If you have not decided, let us know and we will try to help with that. Excellent intro to the site I look forward to seeing more and helping in any way possible. Well I'm thinking either Black Legion or Word Bearers... but I might go for Red Corsairs. I might finally decide when I've got the whole thing basically set up, then I can decide and start to customise it. Now there are several ways you can go about an undersuit. The easiest way would just be to wear a one piece black bodysuit, much in the same way stormtroopers do. But, for a more acurate look you could try to replicate the ribbed look that the inner elbows and knees of power amrour has. Off the top of my head, the best way to do this would be to get a square piece of black, elastic like material, big enough to cover the gaps and also overlap into the armour. Once you've got a piece that covers the gap with some overlap, you'll want to add velcro strips to the inside of the armour ( A note here, use the loop velcro, not the hook velcro for this part, as it wont snap on any clothes you are wearing beneath). Use industiral velcro as it will last longer and it's self adhesive is far superior. Next you'll want to sew the hook velcro onto the material so it wont come loose. Once this stage is done, you'll have something that closes the gap and also joins the plates, keeping them more secure. Now for detailing. Measure out the area of exposed material. Then take strips of leather, cut about 1cm wide and to length. Sew these to the material to give the exposeda area that ribbed look. 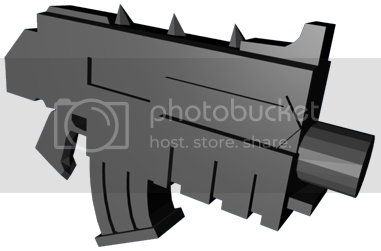 It should look good, offer good flexability and also serve as a way to fasten your armour plates together. 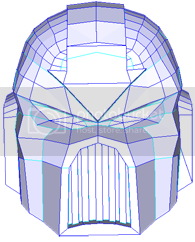 First, once the helmet build is finished, you may way to carefulyl cut out sections of the gril, to allow airflow into the helmet. You can cover the holes with black screen mesh from behind. Next you want to get hold of some 12v computer fans to mount in the helmet. There are a couple of videos on youtube on how to mount fans in helmets that will help. 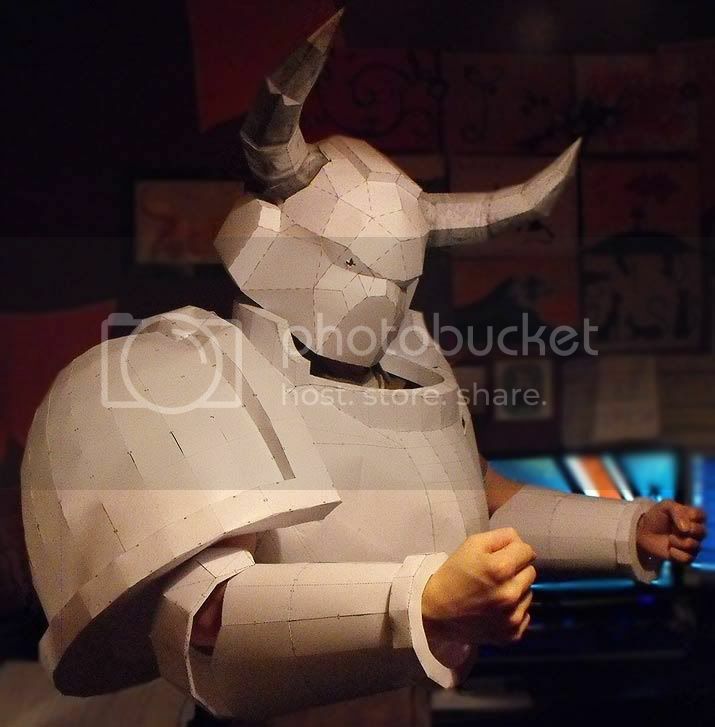 I reccommend searching for costumebot for a really good one. Once you have sorted the air con, it may be time to consider some sort of voice projection. There are countless ways of mounting speakers in the chest piece, linked to a mic in the helmet that will give your voice that voxx sound. It's best to experiment and see what suits you best. I hope at least some of this helps, and if I think of anything else, I'll be sure to swoop in an mention it lol. I cant wait to see this finished, it will be awesome, just, whatever you do, do not make the back pack to small, seen many a good costume ruined by a under (or over) sized power pack. If you make it and its to heavy put a helium balloon in it, as it will help lighten it. theirs my mini rant done, but seriously traitor back packs are large, and probably heavy. You use the program to digitally design a 3D image which is then printed onto paper. Is there a certain type of paper you have to purchase (I presume so) and if so, where do you get it from?